Greetings to all my readers this Thanksgiving weekend. May your thoughts be focused on all the things you have to thank God for, rather than on the things of this present evil world! Galatians 1:3 Grace be to you and peace from God the Father, and from our Lord Jesus Christ, 4 Who gave himself for our sins, that he might deliver us from this present evil world, according to the will of God and our Father: 5 To whom be glory for ever and ever. Amen. Here’s an unusual dish to try. We learned this from a “Loosiana boy” who lived with us for a while and from his mother. One warning – it smells a little weird when it’s cooking, but it tastes good when you eat it! Melt 1 stick of butter in a non-iron pot. Season 1 lb. raw crawfish tails with Cajun Seasoning. Mix well. Add 1 Tbl. of paprika to the butter. Stir in. Add crawfish tails. Sauté crawfish for about 5 minutes. Simmer 40 minutes, stirring often. Check taste. Add salt if needed, or garlic or onion. Add 2 Tbl. cornstarch mixed with a little water or broth spooned from the pot. Cook till slightly thickened. Serve with rice. In large mixing bowl, cream butter, shortening, sugars and vanilla. Beat in eggs. Combine dry ingredients; add to creamed mixture. Stir in chocolate chips and nuts. Drop by tablespoonfuls onto greased cookie sheets. Bake at 350F for 10-12 min. or till lightly browned. Remove to racks to cool. I have had these come out a bit too thin at times. If this happens (they spread out too far) add a little flour to stiffen them up. I got this recipe years ago from Country Extra magazine and made a few changes. Also, I would not try to reduce the sugar. I am a snacker first and last. I get the munchies on a fairly regular basis. Eating smaller meals and having a late morning and later afternoon snack can actually be beneficial, and is sometimes necessary for me, but eating healthy snacks is sometimes the challenge, especially with my sweet tooth. I do not happen to eat a lot of bread. I used to, but since our whole grain bread is heavy and carbohydrate rich, I like to get my carbs from things that I like better. Because of this I don’t always get all the jam I’d like – especially our wonderful homemade jam. 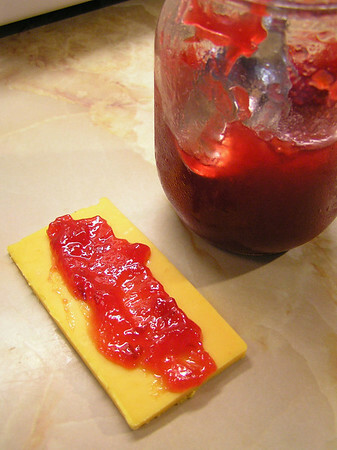 When I have a craving for some jam, instead of spreading it on a cracker or piece of bread I will sometimes eat it on a slice of cheese. :-) I probably get more jam than I should sometimes, but with some of our recent efforts at lower sugar jams this is not as much an issue as it once was. Also, the freezer jams are more like eating fresh fruit spreads to me. It’s not only tasty, it’s colorful too! Yum! Soak gelatin in the 1 cup of water in blender while assembling the other ingredients. Pour the boiling water over soaked gelatin and whisk briefly to dissolve. Cool slightly. Add cashews and blend thoroughly while adding remaining ingredients. Blend until mixture is the consistency of a cream sauce, with no pimento or carrot seen. Pour into a quart mold, cool slightly. Cover before refrigerating. Refrigerate over night before serving. After this firming period, it can be frozen. This melts over hot dishes. Leave out the gelatin for a fondue type of cheese. This recipe came from my friend, Theresa. She said that she couldn’t find the raw cashews that the recipe originally called for so she substituted roasted, salted ones. She said it turned out fine and that her family liked it grated onto food in place of cheese. I have not tried this recipe myself. I am posting it for those who can’t have dairy products but like grated cheese on their food. I hope it works out for you. It’s worth a try. As I mentioned, the original recipe called for raw cashews. I changed this because I have heard that raw cashews are not safe to eat without a specific processing which was not included in this recipe. If you wish to try them instead please find out the proper way to treat them before use so that they are safe to eat. 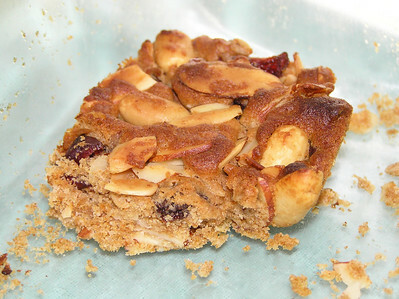 I got this recipe for breakfast bars from my friend Beth. I thought they were so delicious I could hardly stop eating them! In a small bowl, combine flour, salt and baking soda. In a large bowl, combine oil, agave and vanilla. Stir dry ingredients into wet. 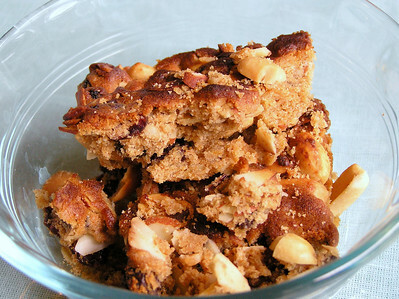 Mix in nuts and raisins. Grease an 8x8 baking dish with oil. 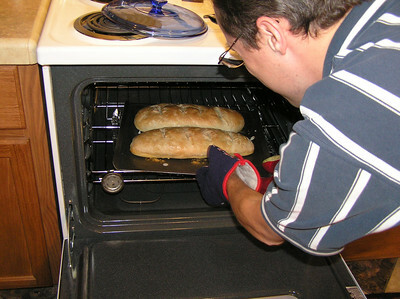 Press the dough into the baking dish, wetting your hands with oil to help pat the dough down evenly if necessary. Bake at 350° for 20 minutes (or till golden brown). Cool and Serve. Note: They are also good warm (with milk over them if desired), but will be crumbly when served this way. These turned out really well, though I got mine just a bit too dark. I loved the nutty looking texture with the bits of red cranberry peaking out. This is at once both disgusting and humorous. 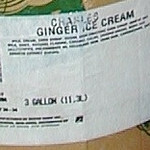 It shows rather graphically what kind of gross stuff is in low quality ice cream. Is it food? Is it filler? What is it??!! This project was undertaken by Laura at the Heavenly Homemakers blog. She has done quite a good job with it so I feel no call to repeat it myself. Besides that, I’m not really surprised at the results. It was probably predictable to some degree. I agree with her conclusions. Buy ice cream with real ingredients, even if it costs more or, better yet, make homemade!! 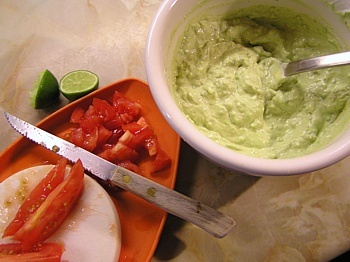 Here is our recipe for guacamole - to go with the Taco Soup recipe, or for any time you want to make guacamole. We used to make a different style of guacamole, but after a friend expressed how he like the taste and/or texture of the store bought variety better, I came up with this alternative. Interestingly, though the mayonnaise is non-traditional, we like it better this way. Mix all ingredients in a small - med. bowl. If avocado does not mash enough just from mixing you may wish to smash the chunks against the side of the bowl in order to make a smoother texture. Serve with chopped black olives and tomatoes, and grated cheese. You may mix these in or use them to garnish the top. 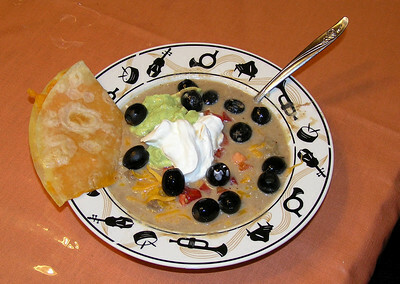 A dollop of sour cream and a black olive on top also looks nice when serving it. Mix refried beans with broth over medium heat in a large pan. Add seasonings and meat. Cook, stirring often, till it is heated through or just coming to a boil. 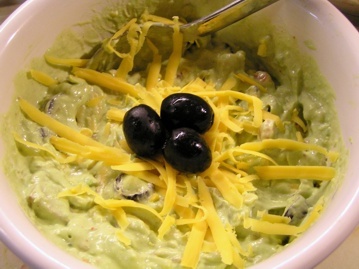 Serve with chopped black olives, guacamole, sour cream, grated cheese and chopped tomatoes. Chopped onions - optional. Also, serve with warm tortillas, quesadillas, or tortilla chips. Note: If you want a creamier soup, mix some sour cream into it while it is cooking. As you can see, I don’t have exact measurements for this. It is one of the recipes that I know “what” but not “how much”, so I make it “by the seat of my pants”. :-) Make it agree to your family’s taste. Also, I think this recipe could be made gluten-free. Matthew 6:19 Lay not up for yourselves treasures upon earth, where moth and rust doth corrupt, and where thieves break through and steal: 20 But lay up for yourselves treasures in heaven, where neither moth nor rust doth corrupt, and where thieves do not break through nor steal: 21 For where your treasure is, there will your heart be also. 22The light of the body is the eye: if therefore thine eye be single, thy whole body shall be full of light. 23 But if thine eye be evil, thy whole body shall be full of darkness. If therefore the light that is in thee be darkness, how great is that darkness! 24 No man can serve two masters: for either he will hate the one, and love the other; or else he will hold to the one, and despise the other. Ye cannot serve God and mammon. I think that it is very interesting that the eyes are mentioned in the same context as the laying up of treasures. How often our eyes get us into trouble when it comes to coveting things! The Western world is full of the idea that if you want it then you should have it, yea, you even deserve it. Those who desire to serve God must fight this temptation and urging of society because we cannot serve God and the lust of things at the same time. They are incompatible - as darkness and light. 1Timothy 6:8 And having food and raiment let us be therewith content. 9 But they that will be rich fall into temptation and a snare, and into many foolish and hurtful lusts, which drown men in destruction and perdition. 10 For the love of money is the root of all evil: which while some coveted after, they have erred from the faith, and pierced themselves through with many sorrows. 11 But thou, O man of God, flee these things; and follow after righteousness, godliness, faith, love, patience, meekness. In this spirit of this I also suggest you read this post at my dad’s blog: What Are You Holding Onto? 1John 2:15 Love not the world, neither the things that are in the world. If any man love the world, the love of the Father is not in him. 16 For all that is in the world, the lust of the flesh, and the lust of the eyes, and the pride of life, is not of the Father, but is of the world.17 And the world passeth away, and the lust thereof: but he that doeth the will of God abideth for ever. Notice that “If any man love the world, the love of the Father is not in him.” That is a powerful statement and something we ought to take much to heart. After all, this world is so temporary. It “passeth away” (present tense – it is in the process of doing so continuously, in case you hadn’t noticed). And, it is all going to burn according to 2Peter 3:11-12, Seeing then that all these things shall be dissolved, what manner of persons ought ye to be in all holy conversation and godliness, Looking for and hasting unto the coming of the day of God, wherein the heavens being on fire shall be dissolved, and the elements shall melt with fervent heat? I wonder how often we remember that the will of God for us is to “love not the world”? We get so caught up with the things of this life sometimes that I’m afraid we tend to forget that. Hmmm…I am wondering how to implement this. Maybe writing “Love not the world” across my wallet in permanent ink would be a good reminder. :-) Putting a sticky note on the credit/debit card with this on it might help too. September 11 is a date that lives in infamy for most Americans. To some degree this is rightly so considering how many people lost their lives that day in NYC and considering also how many (more) people there were emotionally scarred for the rest of their lives. But, as Christians, it seems to me that we should be able to rise above the hate while not falling into the folly of justifying the wicked. In short, we should not be overcome of evil, but overcome it with good! One verse that stands out in my mind in relation to Sept. 11 is Psalm 76:10, Surely the wrath of man shall praise thee: the remainder of wrath shalt thou restrain. This is an amazing verse. How can the wrath of man praise the Lord? We cannot always understand this, maybe seldom. But, in a sense I think that sometimes we may have opportunity to help turn evil to good, or to the praise of the Lord. Sept. 11 is one area where I can see this possibility. Some might like to set this day aside for fasting and prayer for specific requests related to the day. Others might like to use the day to do good to those who have suffered serious loss. Perhaps it would be fitting to use this day to visit a Muslim area in this country and leave tracts or distribute Bibles where possible. There are many options. Years ago my grandparents worked with a missionary lady who had an interesting little thing she asked people to do to remember to pray for her. She asked them when they happened to notice the clock reading 11:11 if they would take a moment to pray for her and her work. I read this in her prayer letter once and it stuck in my mind. Years later, after the September 11 debacle, I was thinking about that and different things, and the Lord reminded me of that request. 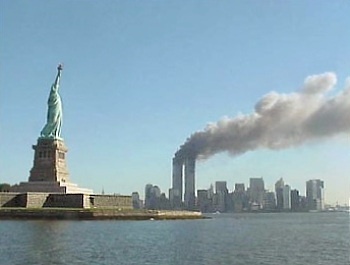 I purposed in my heart that whenever I saw the clock read 9:11 (and at times other instances of 911) I would take a few moments to pray that more Muslims would hear the Gospel and understand their need of salvation and that more Christian Arabs would realize the need to stop using the name “Allah” for the true God. It only takes a few seconds, and I don’t even usually bow my head and close my eyes but just talk to the Lord from my heart. Maybe you can think of some other ways that you can turn the wrath of man that was so vividly displayed on that day into praise of God Almighty. I encourage you to find some way to overcome evil with good to the glory of the Lord! It is much more profitable than wallowing in the sordid memories and angst that this date can call up. August 31st is National Trail Mix Day. 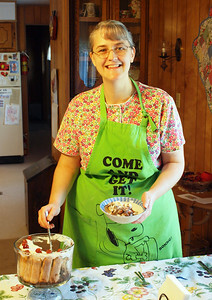 This is a good opportunity to share my trail mix recipe, which I learned from my mom. Use the quantities that you like, but the “base” is the nuts. Mix in a large bowl. Store in an air tight container. 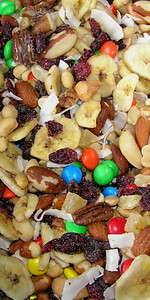 This trail mix is a nice combination of protein, fruit and carbohydrates. It makes a great take along snack for trips or to carry on a long shopping day. It is also quite filling. You could add some pretzel bits or small cookies as well if you wish. Two years ago our family and some local friends had the privilege of providing a birthday party for our mutual friend, Jim S., who was away from his family at the time doing Army training here in Texas. We really enjoyed doing this for him at a time when he was missing his family sorely (he was just home from Iraq!). 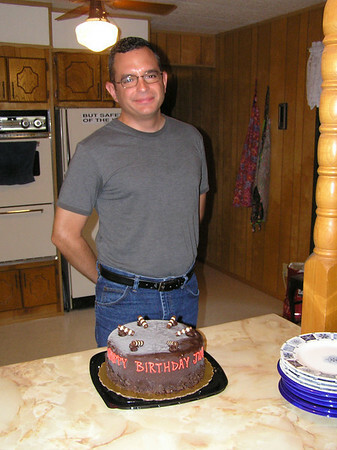 Here is Jim with his ice cream birthday cake. We consulted his wife as to the best kind of cake for him and she suggested this. We got it at Coldstone, which is now closed here, so it was a once only occasion! 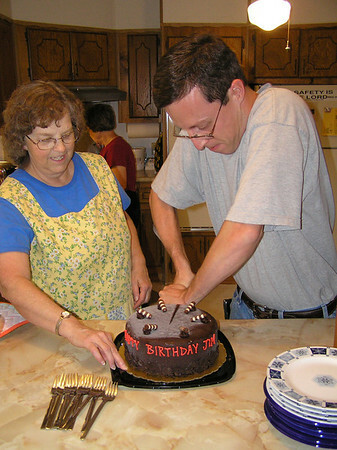 Here is my husband, Peter, cutting the cake for us with a little help from Mom! It was quite a job. What a great evening to remember! :-) Good food, good friends and good fellowship is a great combination! Food plays a very important role in our memories of life. A simple food or meal can have such strong associations for us that we love it (or maybe hate it) just because of the memory attached to it. Sometimes we remember specific meals because they were particularly special or memorable in some way. Here is a meal that I remember fondly. 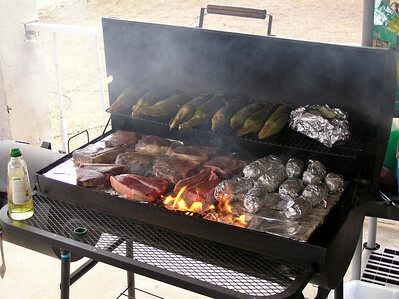 It was the feast that my brother, Mike, and his wife made for us when we arrived in Texas from Tennessee. 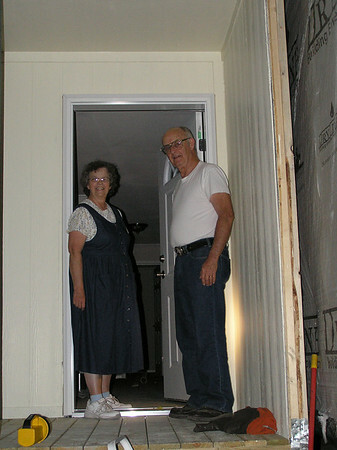 They also invited some of our friends who had helped with the moving process and my sister-in-law’s parents. It was absolutely delectable! My grandmothers thought that watermelon was one of the finer foods. They both loved it! I liked it pretty well when I was younger, but I didn’t quite understand their great liking for it. One summer a few years back I suddenly discovered that I also had a strong craving for watermelon. I think I probably enjoy it now almost as much as they did! Funny how as we get older we understand our grandmothers’ and mothers’ feelings about some things more and more. 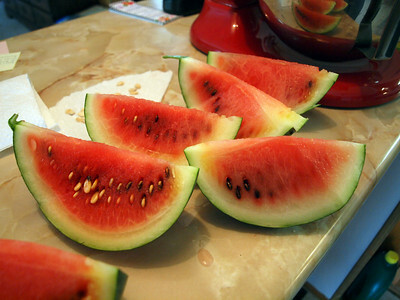 :-) I’m thankful God created this amazing, juicy fruit that can be grown in such hot climates! :-) I’m also very thankful that we have not had such a bad drought this year and have been able to grow a much better garden! In small bowl, stir together graham cracker crumbs and brown sugar. Add butter and mix well. Press into the bottom of an 8 – 10 inch spring form pan. Chill until firm. In a medium bowl, beat together the cream cheese and lemon juice until sort. Mix in sour cream. Add whipping cream and beat with electric mixer until batter becomes thick. Add the sugar and continue to beat until stiff. Pour into the chilled crust. Chill several hours or overnight. Add topping of your choice. Remove sides of pan just before serving. 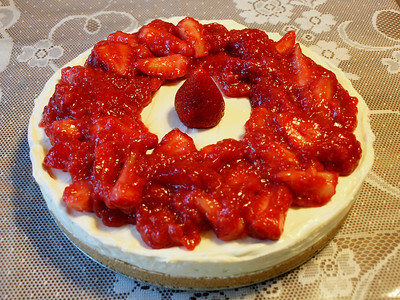 I served this with a homemade strawberry topping as you can see in the photos. 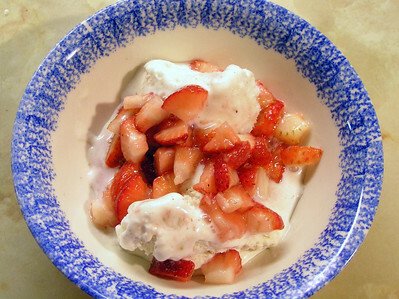 I made this topping by cooking a few strawberries, sweetening them and then thickening them with corn starch. I refrigerated the “gel” before adding the cut fresh strawberries. It was delicious! Much better than that pre-made stuff you can buy in plastic envelopes at the store. Joy of Baking – English or Afternoon Tea Party Recipes – The pictures say it all here. 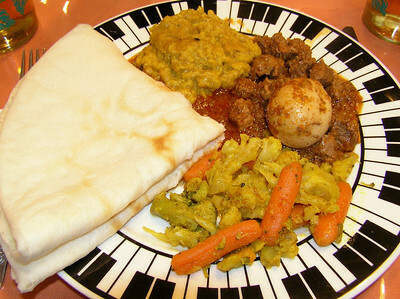 Traditional English Recipes – This will require some conversion work since the measurements are mostly given by weight. Here is an online converter to help with the process. Here is a chart that gives the equivalents for heat temperatures in the oven. 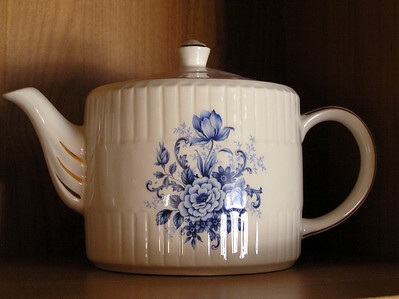 This was my grandma’s teapot which I think she may have gotten in England or Ireland. July 21st is National Ice Cream Day. My family has made our own ice cream off and on for years. 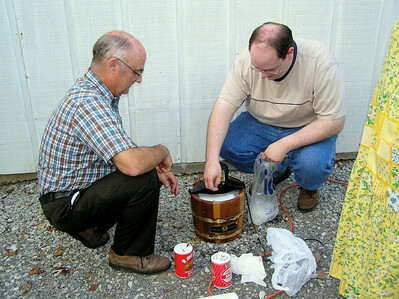 Here are some photos of one ice cream making event in 2005. Daddy and Dan operate the machine with supervision from Mom. 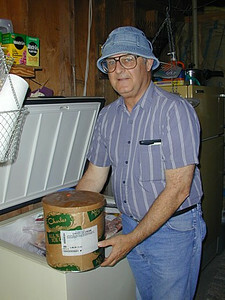 This was taken in Tennessee and was the last time we used our “old fashioned” ice cream maker. Obviously, it is not the old crank handle kind. My parents now have a counter top ice cream maker that works much faster, though it makes a smaller amount and is only slightly less noisy than this old one was. It is amazing how much folly there is in the Lord’s church today. There is such worldliness and tolerance of unbiblical practices and traditions that it is appalling. Yet you can see that at least some of these people want to be known as Christians and to appear to stand for something. Though we cannot join them nor approve their ways it behooves us to remember that “whom the Lord loveth he chasteneth”! (Hebrews 12:6 – emphasis added.) He does still love these believers and desires to see them turn from folly. Those who try to avoid the spiritual “pollutions of the world” (2 Peter 2:20) should too. Rather than feeling self-righteous, we should be grieved and our hearts should hurt to see those whom God loves walking in ways that are contrary to His word. Sometimes it is hard because they don’t understand the error of their ways and are offended if we extend a rebuking observation toward them, but it is keeping with the mind of Christ for us to maintain godly love toward them. 1John 4:10 Herein is love, not that we loved God, but that he loved us, and sent his Son to be the propitiation for our sins. 11 Beloved, if God so loved us, we ought also to love one another. Here’s an old family favorite of ours. My mom and grandma both used to make this light, tangy salad in the summer. It is almost more like pickles than salad. Since it’s served cold it is refreshing during hot weather. 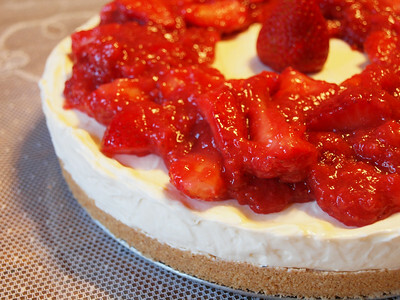 Mix all ingredients and refrigerate for about 30 minutes. Serve cold. The Turkey Shot Out of the Oven – A great humorous item to use at Thanksgiving time or any time you serve a turkey dinner. Whining and Dining – Yes, I actually did write this one – for whatever it’s worth. I have one window in my kitchen. It is opposite the sink and counter where I work, so I don’t get to look out of it while I’m working much. But, I do get to see interesting things from that vantage point from time to time. Actually, there is a sort of window over the kitchen sink, but it opens into the living room now since some former owner of this place made a large living room/sun room addition (a room for which I’m very thankful). The window where I can see outside was originally the dining area window, so it is a full length window, though not wide. 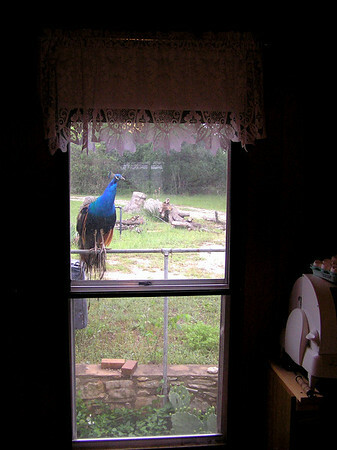 Not everyone has the unique experience of having a peacock peeking in their kitchen window. It was a bit startling at first, but he is really harmless, though apparently quite curious. This bird is a stray that showed up at our neighbor’s house at some point. 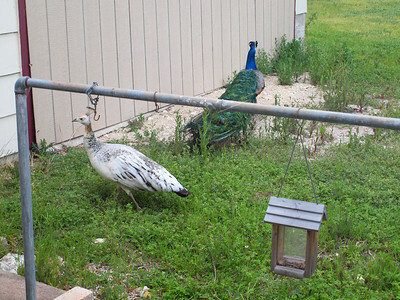 She doesn’t know where he came from, though there are some other “wild” peacocks in the area. She calls him “Petey”. I haven’t seen him for some time now, but he was a regular visitor around here for quite a while. 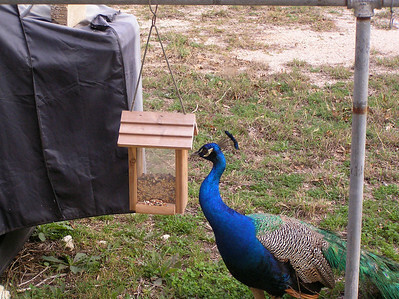 He wandered with the neighbor’s guinea fowl, and seemed to think that he should show off for the females sometimes and that he was responsible to look out for the flock. Cooking by the seat of your pants….or…skirt as the case may be. Back in the old days of flying airplanes before there were many, if any, instruments to rely on, it was not unusual to say that a pilot flew “by the seat of his pants”. The implication was that he flew on instinct and his own judgment more than anything. My parents taught me to cook this way. My mom was not a menu planner type. We ate what was on sale, what was in our pantry and what was in our freezer or fresh from our garden. Despite some assertions that you can save a lot of money by planning meal menus a week or month in advance, this method saved us a lot of money over the years, I’m sure. We didn’t make many last minute trips to the store for items we “needed” to make a recipe. We made things that we had the ingredients for to begin with. The point was that we stored a lot of our food needs, and we grew a lot of our own food in the summer. The first thing I have to say about this method is that you need to become familiar enough with basic cooking skills so that you aren’t afraid to cook something without a recipe. (We seldom, if ever, made baked goods by this method, by the way.) Having confidence in how to sauté, fry, boil, steam, etc. basic foods is important to being successful in this method of cooking. A simple chart on how long to cook meats will be helpful too, and a meat thermometer is a good investment for any style of cooking. My mom’s cooking was largely emphasized on basic meals, so her cooking in this manner tended to be more along the lines of good, plain cooking. 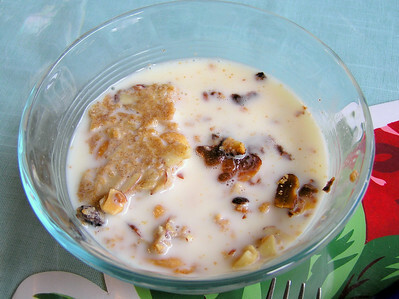 Hot cereal (sometimes with special additions), toast, eggs in a variety of styles, but often boiled, covered the basic week day breakfasts. She turned out pancakes (used a recipe), French toast, and other goodies for Saturdays. Often the pancakes had M&Ms added for a fun touch. Sundays we ate mostly cold cereal as that was always a busy morning of rushing to get ready for church meetings. Lunches involved sandwiches, quesadillas, cheese melted on bread with gravy, yogurt, and other simple meals. Occasionally, we had tuna or egg salad. 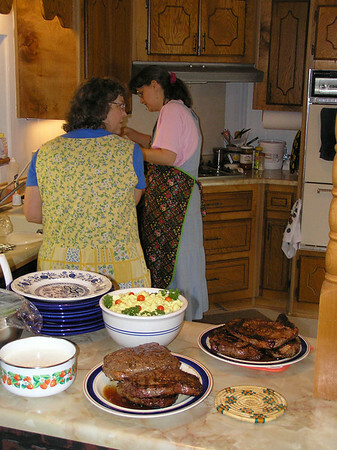 Dinners were more involved and usually had a meat, a carbohydrate, a vegetable and a salad. She tended to go to more effort on that than I usually do these days, but she had a family of 6 to feed, so she needed plenty of food. We ate a lot of chicken for dinner as it was cheap. :-) Fortunately for me, that is my favorite meat, so I wasn’t unhappy about that. 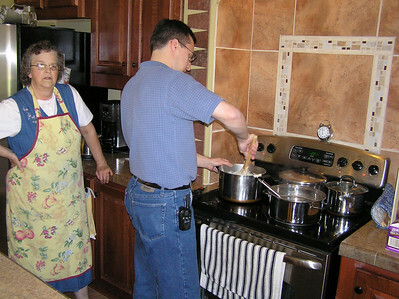 Mom also did a lot of her own canning (with help from her favorite kitchen helpers – us kids!). Her spaghetti sauce was famous. She put up a variety of jams, jellies, pickles, relishes, sauces, pie fillings, vegetables and even some meat and stocks. She also froze a goodly portion of vegetables, fruits and meats. This was a huge help to our budget and it also made cooking by the seat of the pants much easier. My own style of cooking came out somewhere in between. 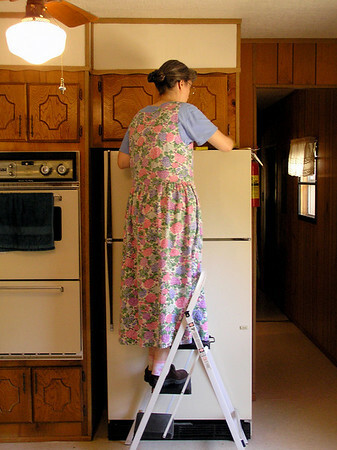 I learned a lot of good, plain cooking skills from Mom, along with the ability to invent meals on the fly from what’s in the cupboards and freezer. From Daddy I learned to season and spice with more confidence than Mom usually had, and to try some more “exotic” things. I tried to be somewhat bold with my cooking, but not to the point of creating too many really awful dishes. 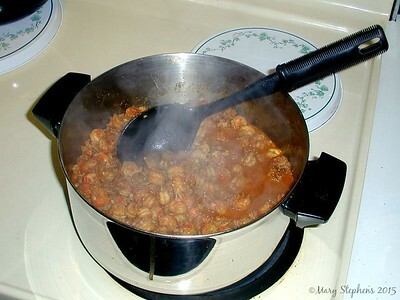 ;-) My favorite meals tend to be flash-in-the-pan, and usually one or two pot meals. I am going to try to share some “recipes” here for some things that will require you to use your own judgment – cook by the seat of your pants, as it were. I will share the basic idea – ingredients and methods of cooking – but will leave you to figure out the amounts and sometimes even spicing to your own tastes. You will need to have some courage in trying these recipes. However, with this kind of cooking it is important to remember that, aside from burning or scorching something or making it really unpalatable, it’s kind of hard to do it “wrong”. If you like the way it turns out; or if your husband or family like the way it turns out (even if you don’t), then it was a success! And, remember, if you want to make it again the same way you have to write down the amounts, or at least what you used! :-) I suggest a small notebook or blank book for this. Hopefully, these additions to this blog will help someone learn to be more brave in their cooking and to have the confidence to cook without recipes or menus, using only ingredients that are at hand. I suspect that people who need to can and freeze their own food and buy in quantity in order to save money tend to learn this type of cooking more than people who buy according to a pre-made menu. I consider it a useful skill and something that cooks should cultivate. Some people will find it burdensome to have to think of things to make on the spur of the moment, even I do at times. If you are strongly that type, you had better stick with the menu planning for most of your meals. But, for those who can think on the fly, so to speak, it has a certain amount of freedom. I don’t have to think up a lot of menus, and I don’t have to take the time to sit down and write one out and then try to find the best prices on what I need. I tend to shop more for what’s on sale that I know I can store and we will use in a reasonable amount of time. Having a variety of useful foods ready at hand makes this method work really well, and the savings is in buying mostly sale items, mark downs, and in bulk. Having a nice variety of herbs and spices that you like is helpful also. Dried is, of course, the more practical way to go with herbs and spices. I freeze some in order to get that fresh taste. They turn out darker, but they have a fresher flavor than the dried ones. One caution: It is important to rotate your stock of things and use them up in a timely manner. Put dates on canned goods you make or buy so that you know how old they are and which to use first. Keeping dried goods such as flour, pasta, rice and beans in a good rotation can be more of a challenge. Flours, especially, can go “rancid” in taste, and so it’s best to make sure you use them quickly enough. This part is harder to get down and I’ve had trouble with it myself. Remember to always store almonds in the fridge or freezer. All nuts will be better stored in the freezer if you will not be using them up in a few months. (Nuts can also be canned.) Herbs and spices will lose their flavor over time, but they tend to last longer than flours, nuts, etc. if stored in a cool, dry place. Keep things out of the sun as much as possible, and out of especially hot places, as well. Even home canned food should be stored away from the sun (because the glass jars allow the light to reach the food). Also, be sure to store dried goods and herbs/spices in sealed containers. 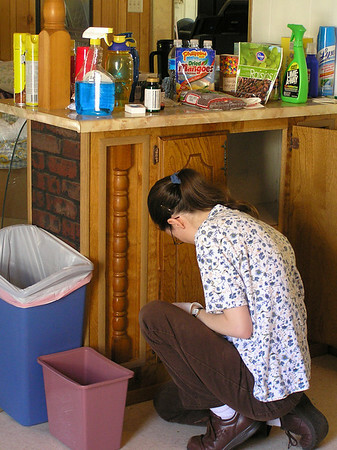 Bugs can ruin your stored food if you don’t do this, and air or moisture will make them go bad or lose flavor quicker. I’m sure you can find web sites that offer information on storing food items if you need more help with this. If you’d like to try this style of cooking, dig in and enjoy! Remember – it’s supposed to be fun to cook this way. Think of it as an adventure in the kitchen! The only “wrong” way to do this is to burn it or actually make it taste bad, and that’s possible to do with any recipe. :-) So, be brave! And, if you have questions, just ask. Combine the sugar and cinnamon and sprinkle over apples. Mix together egg, sugar, flour, salt, and margarine, and nuts and spread over the apples. Bake 35 to 45 minutes at 350 degrees. Make sure it is brown on the top and done in the middle. (I sometimes double this and put it in a 9 x 13). 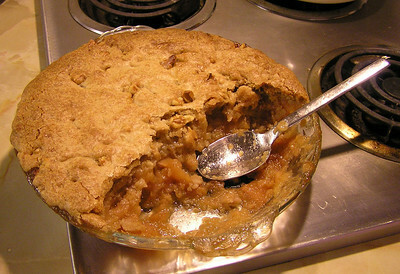 Note: If you make your own apple pie filling this recipe takes one quart. Canned apple pie filling makes this recipe super quick! Also, you may wish to substitute half of the flour with whole wheat flour to improve the food value. You could also reduce the sugar to 2/3 cup. Try adding raisins or cranberries too! 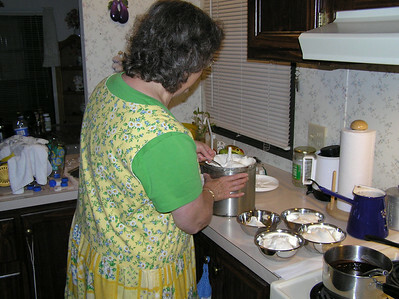 July 1st is “Creative Ice Cream Flavor Day”, so I thought I’d post my Mom’s best home made ice cream invention. It is coconut pecan ice cream with cherries. I don’t have exact measurements, but if you make your own ice cream you can probably figure out how to do this. She uses coconut milk for part of the milk in the recipe, then she adds shredded (unsweetened) coconut. Toward the very end (so that they won’t be totally disintegrated by the mixing process) she adds maraschino cherries and broken pecan pieces. 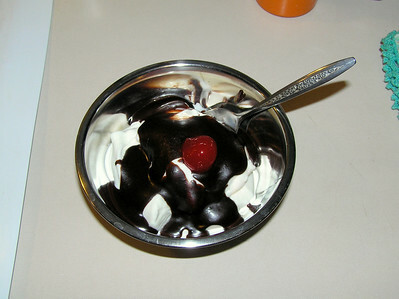 It is delicious, and chocolate syrup or hot fudge sauce makes it even better! As you can see he got a large container of it! A mouse had also gotten into the kitchen and decided it was a nice condominium sometime not long before we arrived, unbeknown to Mike and Sarah. The droppings here and there didn’t add to the overall attraction of the place. It even had gotten into the fridge, which was propped open to keep it from stinking! 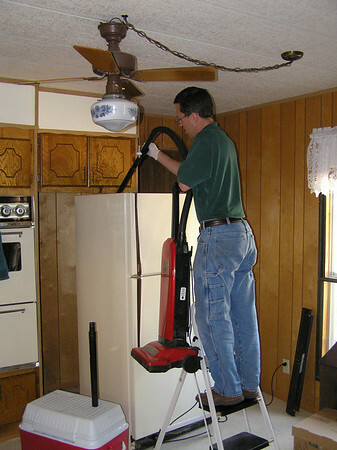 Here I am cleaning up the top of the fridge. 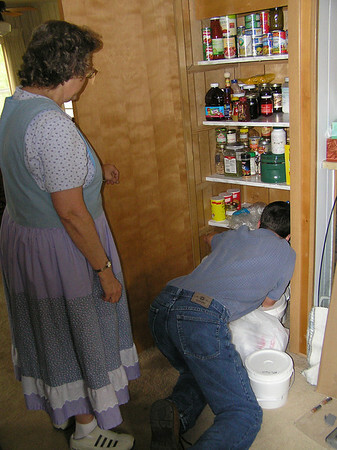 Here my mom and Peter are working on organizing the pantry and putting away the buckets at the bottom. It was a work in progress because it took me a while to figure out where I wanted and needed everything. Our friend Mrs. M. loaded a lot of the stuff into the pantry for me, which was helpful. There were many others who helped with the moving process. I’m very grateful to all the folks who helped us move into our “new” house! It was a blessing from the Lord to have so many helping hands. Fixing mistakes and using imperfect foods. 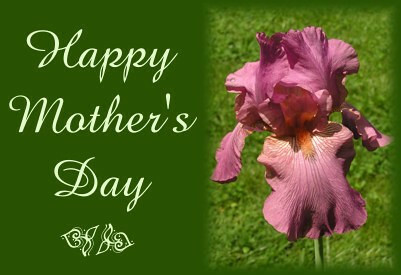 Have a great day honoring your fathers and the fathers of your children, ladies! :-) May God bless the Christian fathers with His wisdom, strength and grace! Here are a few links that might be of interest. If you are looking for something a bit out of the ordinary, or very out of the ordinary you might find just what you want here! Enjoy! This came from my friend, Venessa. 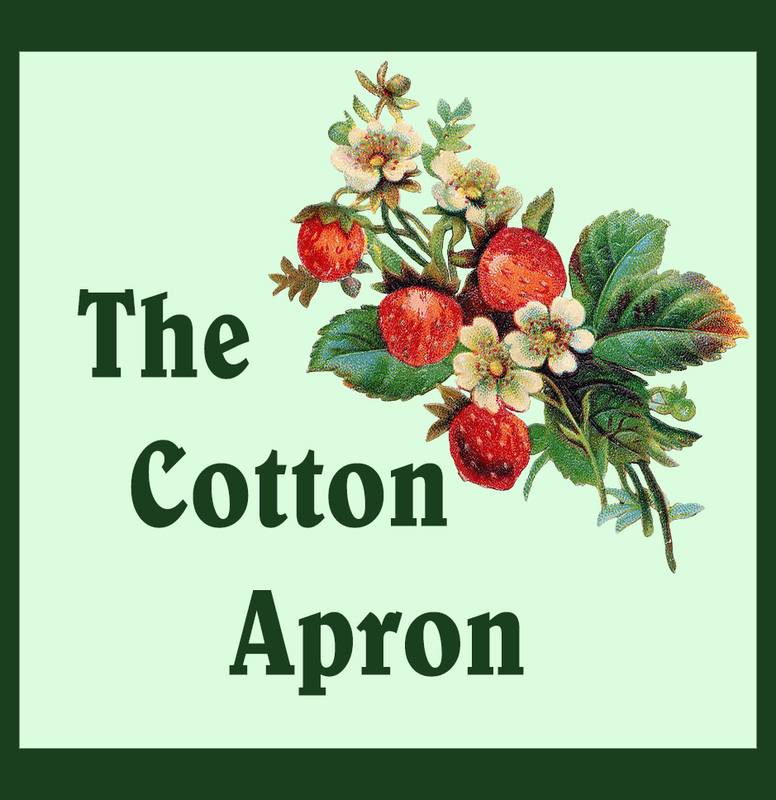 The blog is written by the church cook where they fellowship. There are some pretty fancy recipes here! Some look easier than others. Some truly amazing grilled cheese sandwich recipes! You only thought you knew all there was to know about grilled cheese. Happy Birthday to my favorite baker and cook! 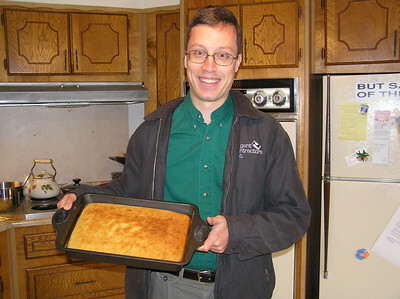 In honor of my husband’s birthday I wanted to post some pictures of him cooking and baking. He had learned to cook some before we got married, but since then he has worked hard to improve his skills. In fact, he insists on cooking breakfast for us every Sunday. :-) He has become quite talented, especially as a baker! 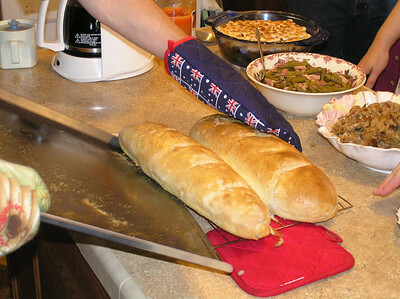 Peter’s first effort at French bread, made for our Thanksgiving dinner last November. This was in my Mom’s kitchen. They turned out very well and were delicious! 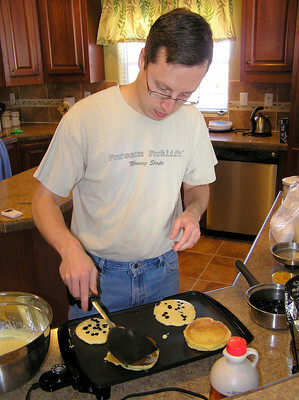 Here he is making pancakes at my brother and sister-in-law’s house. This was our first meal together with them in their new house! :-) (He has added blueberries to the pancakes before turning them. He also did some with chocolate chips. Very yummy!) His pancakes are very good. 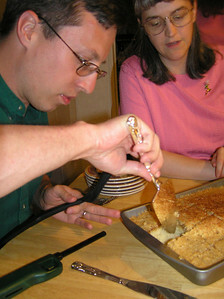 Peter and me with the cake he made for my birthday in April of 2009. It was Lazy Daisy Cake. In honor of National Egg Day I thought I’d post a photo of eggs from our own free range chickens. The “girls” are real rascals sometimes, but they do know how to lay a fine egg! 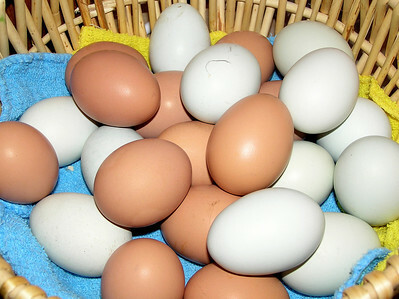 The eggs that look white are actually pale green-blue. They are from our Ameraucana chickens. "The thought of two thousand people crunching celery at the same time horrified me." - George Bernard Shaw (1856-1950). Explaining why he had turned down an invitation to a vegetarian gala dinner. You don't lose much weight, but from a distance your friends think you look thinner. Vegetables are interesting but lack a sense of purpose when unaccompanied by a good cut of meat. – Fran L.
The West wasn’t won on salad. “I would like to find a stew that will give me heartburn immediately, instead of at three o'clock in the morning.” ~John B. My favorite animal is steak. ~Fran L.
And I find chopsticks frankly distressing. Am I alone in thinking it odd that a people ingenious enough to invent paper, gunpowder, kites and any number of other useful objects, and who have a noble history extending back 3,000 years haven't yet worked out that a pair of knitting needles is no way to capture food? ~Bill B. Old Fashioned Pull Taffy – This recipe looks more appetizing. Maybe it would be good to use this recipe and follow the instructions from the page above. My sister and I have read their homesteading stories and some of their other books, and enjoyed them quite well. They are homeschoolers who moved to northern Wisconsin years ago to become at least partly self-sufficient. The story, as related in their homestead stories, is quite amazing and entertaining! This is their blog world presence. 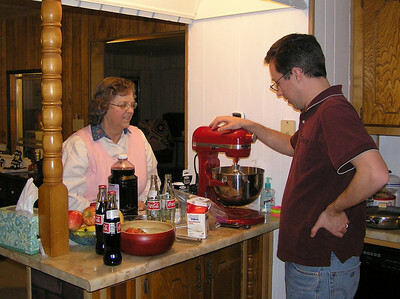 My Mother’s Finest Recipes - This site includes a number of traditional Pennsylvania Dutch recipes. Note: Disclaimer on any inappropriate content at these sites. I didn’t read them in depth! Stir first 3 ingredients together in a medium saucepan. Cut butter into slivers and add. Cook, stirring constantly, over medium heat until butter is melted and mixture begins to boil and/or is thickened. Remove from heat, and stir in vanilla. Serve warm. For a thinner sauce use only 2 Tbs. of flour. For a thicker sauce use 5 Tbs. In a mixing bowl, combine rhubarb, flour, sugar and salt. Spoon into a greased 9x13” baking pan; set aside. For topping: combine flour, brown sugar and oats. Cut in butter till crumbly. Sprinkle over the rhubarb mixture. Bake at 350F for 40 minutes or until lightly browned and bubbly. 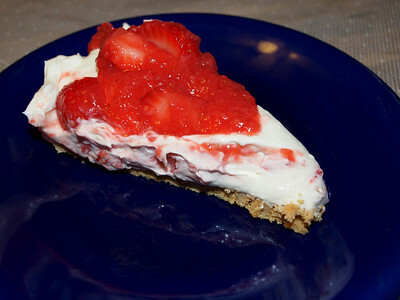 My mom and I made this in January with some frozen rhubarb given to us by a friend. It turned out quite well, but I wanted some kind of sauce to put on it to kind help cut the sharpness that rhubarb sometimes has. So, I looked up a vanilla cream sauce on the internet and came up with something. It was really good on the crumble. Sorry I didn’t take any pictures, but it wasn’t the most striking dessert we ever made since the rhubarb was more green than red. Anyway, I’ll post the vanilla cream sauce recipe as well. It would be equally good on a number of other things – even just poured over fresh fruit. Note: We doubled the original recipe and I accounted for that in the measurements here. However, we had more than double the amount of rhubarb called for. So, please sweeten this to your taste. We also put it in a pan that was “double” what the recipe called for, but it seemed too thin to us. So, in posting the recipe here I have called for a 9x13 inch pan. If this seems too small to you feel free to use a larger one. The one we made did turn out very thin, though, and we would make it in a 9x13 if we make it again, I think. I saw the first part of the Audrey Hepburn movie Breakfast At Tiffany’s. I saw just enough of it to know that I didn’t want to see the rest of it! But, in that movie the heroine that Hepburn portrayed, I forget her “name”, talks about what she does when she is sad - not really depressed, but just sad. She said her solution was to go and eat breakfast at Tiffany’s, a prestigious jewelry store in New York. The movie portrayed her as taking a “to go” breakfast early in the morning to the still closed store, and eating it outside while looking at the window displays. This sad solution was supposed to cure sadness! While I realize this was “just a movie”, I also know that the world finds many “solutions” to sadness, and other problems, that are just like this – empty, hollow, even silly. It is not a solution. It is only an anesthetic of sorts to temporarily numb the mind into forgetting the trouble. Worldly wisdom is full of such things. According to Samuel Johnson, “rudiment” means “The first principles; the first elements of science…The first part of education…The first, inaccurate, unshapen beginning or original of any thing…” So, rudiments of the world would represent those ideals and philosophies and solutions to life that are formed based upon our early knowledge before we are made new creatures in Christ (2 Corinthians 5:17). This solution mentioned in Breakfast at Tiffany’s presents for us the rudiments of the world, I think. My husband leaves very early in the morning for work. He leaves so early that he wouldn’t want me to get up with him. This means that I eat alone most mornings. At first it was hard for me to adjust to eating breakfast alone. It didn’t take long after he started the early morning schedule, though, for me to realize I needed to do something to make breakfast more pleasant for myself in order to start my day with a better frame of mind. I could have read any book, but the Holy Spirit compelled me to spend that time with the Lord, so I started reading my Bible while I eat. I know. Someone will probably think this is “unspiritual” because “we should be totally focused on God’s word when we read it”, or some such thing. I would have thought the same thing years ago. Frankly, I enjoy my breakfasts with the Lord a lot. It helps keep my mind focused on something profitable and useful rather than fretting or going over and over all the things I “need” to get done on a given day. I don’t think that the latter things help digestion much for one thing, and secondly, it’s really nice to “eat with” my Best Friend! Back to the original topic now. What a wonderful blessing it is for those of us who are “in Christ” that we do not have to resort to the world’s empty solutions for dealing with sadness! We are not left comfortless. The Holy Spirit of God will lead us to solutions that are helpful and profitable; things that will edify us and, often, others as well. John 14:26 But the Comforter, which is the Holy Ghost, whom the Father will send in my name, he shall teach you all things, and bring all things to your remembrance, whatsoever I have said unto you. 27 Peace I leave with you, my peace I give unto you: not as the world giveth, give I unto you. Let not your heart be troubled, neither let it be afraid. We who are Christ’s are not stuck with the rudiments of the world! We have better solutions available to us. I hope this doesn’t sound puffed up or self-righteous. It is not intended to be. I just wanted to share this experience and blessing with you. A few weeks ago while working in the kitchen I managed to drop an egg on the floor, or rather part of an egg. I caught part of it still in the shell, but there was still a good amount of egg white on the floor. I hate dropping eggs! It makes such a mess and they are so hard to clean up. It really does tend to spread all over the place as you work on it and it makes it seem like a lot more egg white than it really was! This time, though, I happened to remember reading something about sprinkling flour or corn meal on a mess to clean it up. I think that was corn meal on an oil spill, if I remember correctly. But, I decided to try some flour on the egg white and see what happened. I used some of my white flour (cheaper) and carefully sprinkled it over the egg white. After a few minutes it looked like it needed more, so I added some and kind of spread it around. I left this for a good long time (something that probably wouldn't be practical with small kids or pets around). Later, when I came back to clean it up the flour had soaked in quite a bit and it was much easier to wipe up than the plain egg white would have been! I realize that some would not consider this a good use of their flour, and that I can understand, but for those with limited strength or difficulty in cleaning up such messes this might prove useful. Anyway, I wanted to share it. Eggs on the floor are a nuisance and anything that will help clean it up more efficiently is good news to me!